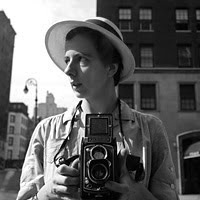 This was created in dedication to the photographer Vivian Maier, a street photographer from the 1950s - 1990s. Vivian's work was discovered at an auction here in Chicago where she resided most of her life. 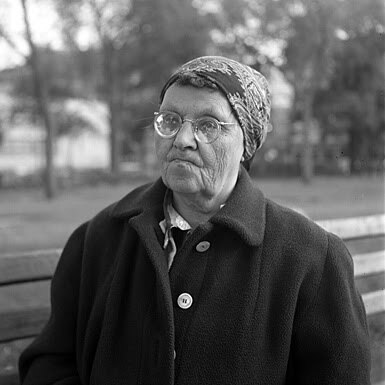 Her discovered work includes over 100,000 mostly medium format negatives (90% of her work), thousands of prints, and countless undeveloped rolls of film. Some have suggested that I add more information on the story of Vivian's work and such. Here is what I know. I acquired Vivian's negatives while at a furniture and antique auction while researching a history book I was co-authoring on Chicago's NW Side. From what I know, the auction house acquired her belongings from her storage locker that was sold off due to delinquent payments. I didn't know what 'street photography' was when I purchased them. It took me days to look through all of her work. It inspired me to pick up photography myself. Little by little, as I progressed as a photographer, I would revisit Vivian's negatives and I would "see" more in her work. I bought her same camera and took to the same streets soon to realize how difficult it was to make images of her caliber. I discovered the eye she had for photography through my own practice. Needless to say, I am attached to her work. After some researching, I have only little information about Vivian. Central Camera (110 yr old camera shop in Chicago) has encountered Vivian from time to time when she would purchase film while out on the Chicago streets. From what they knew of her, they say she was a very "keep your distance from me" type of person but was also outspoken. She loved foreign films and didn't care much for American films. Some of her photos have pictures of children and often times it was near a beach. I later found out she was a nanny for a family on the North Side whose children these most likely were. One of her obituaries states that she lived in Oak Park, a close Chicago suburb, but I later found that she lived in the Rogers Park neighborhood. Out of the more than 100,000 negatives I have in the collection, about 20-30,000 negatives were still in rolls, undeveloped from the 1960's-1970's. I have been successfully developing these rolls. I must say, it's very exciting for me. Most of her negatives that were developed in sleeves have the date and location penciled in French (she had poor penmanship). I found her name written with pencil on a photo-lab envelope. I decided to 'Google' her about a year after I purchased these only to find her obituary placed the day before my search. She passed only a couple of days before that inquiry on her. I wanted to meet her in person well before I found her obituary but, the auction house had stated she was ill, so I didn't want to bother her. So many questions would have been answered if I had. All content of this site is copyrighted under Maloof Collection, Ltd.